It was good fun to do this again. For those who don’t know what this is or have never been to one, it’s pretty cool. It’s basically a demo day. 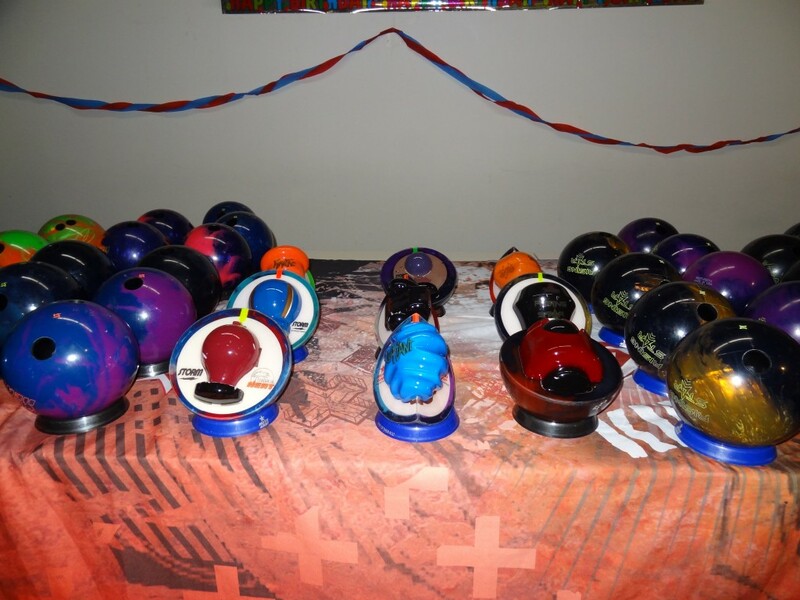 It’s a day when a manufacturer, in this case Storm and Roto Grip come out to a local center with 100 balls or more, all from their current lineup, and allow bowlers an open session to test out all their latest equipment. Basically, they start by fitting your hand. You get a switch grip for your thumb and fingers. They will tell you your span if you don’t know it. Then you find a ball that you want to try, look for the ball that matches your span and weight, stick the switchgrips in and go to the lanes. You can try almost every ball in the lineup, although at times the balls about to be discontinued or the lower end balls are not available. 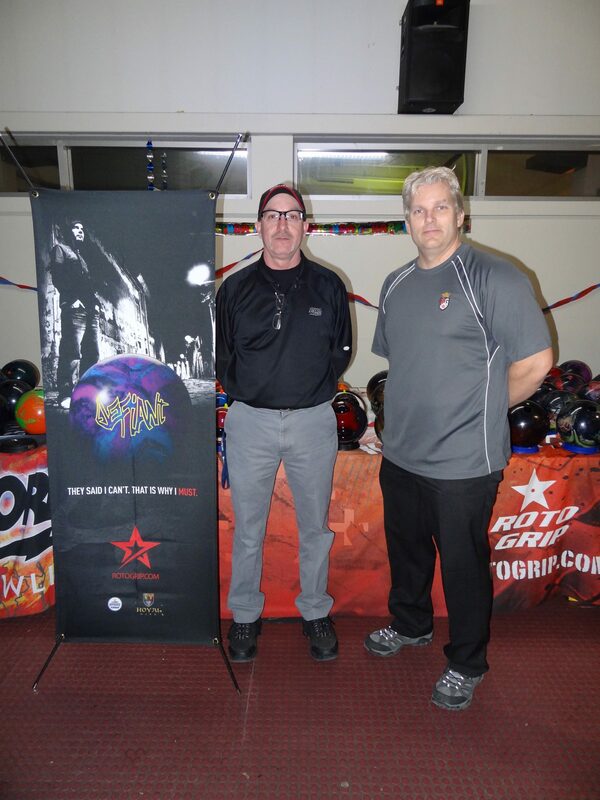 On January 18th, 2012, Doene Moos Storm’s Mid Western Regional Sales Manager came to Planet Bowl in Etobicoke, Ontario, Canada. The Matchmaker session was being run by Eric Deaton of Strike Mor Pro Shop. We can usually gleen something from the balls missing so we can start there. From either, it’s not totally surprising the Urethane balls were not there, although the last time I attended a MatchMaker, they were. However, with the Infinite missing, it tells me it’s likely on its way out. With the development of the Paragon core, it would seem this will cause the eventual phasing out of the Trilliptic core in the Theory line. I know Roto Grip has created a new line called the Royal line, just above the Crown line. We’ll see what happens, but I guess a pearlized and hybrid versions of the Defiant will be up next. From Storm, the Marvel is still around while the Marvel Pearl is pretty new. They’ve also announced the Modern Marvel which seems to replace the Prodigy. This core appears to have some good success so looks to be around a bit longer. Although the HyRoad wasn’t there, as long as it continues to be the best selling ball, I imagine it will hang around. With the announcement of the Crossroad, we’ll see if Storm has finally found a true replacement. It will likely be the closest attempt yet. The 2Fast and 2Furious have been around a bit, even though the Frantic using the same core is fairly new. My guess is they will be phased out relatively soon. If you’ve been following TamerBowling you will know we’ve tested most of these balls already. So this is an opportunity to round back and compare some of the newer equipment. The Defiant looks to be a very promising piece. I usually don’t go crazy over heavy oil pieces but this one is very interesting. When we tested the Critical Theory a little while back, I really felt it was one of the strongest balls around in the sense that it can cover heavier conditions, but still stores lots of energy for a big move on the backend. The Defiant is quite a bit stronger, but maintains the same characteristics in that it keeps coming on the backend. When I tested it, it seemed so versatile. Not that you’ll be able to use it on dry conditions, but rather it is capable of carrying from many different lines to the pocket. I tried 10 to 8, 13 to 7, 15 to 7, 18 to 7, 20 to 6, and 22 to 6. Each time, the ball continued to make the move back to the pocket. I finally got just past 22 at the arrows when it finally left me a flat 10. It’s not flippy, but really seemed to have a more defined move than the Virtual Gravity Nano. It seems to smooth out the lane and release differences. This ball was just a tad more impressive than the Critical Theory when we tested that. It should be clear the Critical Theory (review) is a step down from the Defiant. Depending on how you bowl, it can be a couple of boards to 5 or 7. The Outlaw (review) is honestly one of my favorite balls. It’s a stronger ball but so consistent. I wasn’t 100% sure whether I would like the ball reaction when I saw the core on paper, but I was so impressed by it when I threw it. I think it’s going to be one of those balls that are known for the cover and core matching up extremely well. The Bandit (review) will serve a lot of bowlers who like that more angular pearlized reaction. It is a good step down from the Outlaw. This ball defines skid/flip so if you’re looking for that reaction, it’s a good option. When you talk about bang for the buck, the Shooting Star (review) and Rising Star are two fantastic balls that fit that bill. The Shooting Star is that really nice control ball that has lots of movement and strength, but excellent predictability. Same is true for the Rising Star, but due to the hybrid coverstock, it gets a bit more length so it will look a tad more flippy. However, take a look at the Digitrax analysis and you will see that neither ball is lacking in the backend department. For now, there’s nothing new to say about the Virtual Gravity Nano (review) and Nano Pearl (review). However, I will say that my take is that the Defiant is more versatile and stronger. You have to watch the two ball reactions and decide which one matches up to your game. In the meantime, Storm will be releasing the Vivid soon looks to be of similar strength, but introducing a new core. It will likely have a slightly more defined move than the Virtual Gravity as it adds some contours to the weight block. The rest of the Storm lineup, I’ve reviewed at length so I didn’t gain any new insight here. However, I did get to test some pin down balls which is different to what we’ve tested previously. For my game, it’s not the preferred location so wasn’t too helpful. The news is that Storm is releasing the Crossroad. If this ball is successful, it may finally be the ball that replaces the venerable Hy-Road. It will use the same Hybrid R2S cover with a modified core from the original. It will be interesting to test this one. Also, the Modern Marvel will be released which is a hybrid Marvel. This ball will also be interesting to see. The Prodigy is gone so this replaces it with a slightly different cover. Considering how much of the market Storm and Roto Grip has, it’s good to see that their still putting out interesting equipment. Storm doesn’t seem to stray too far from homebase. They know what works and repeat it over and over. Roto Grip on the other hand strays a bit further trying some new cores recently. I see Roto Grip as being the slightly more edgy brand while Storm is now becoming the stalwart. So if you like Storm/Roto Grip, you have a few more pieces to spend your hard-earned money on. Recently, Roto and Storm did a demo at my alley. Surprisingly, the Shooting Star was missing in Roto’s line-up. According to your review and BTM’s Oct. ’11 stats, this “entry level” priced ball has performance characteristics equivalent to some upper mid priced balls. It’s the one I wanted to test against my comparative Hammer Brawl, which i have to replace because it’s too heavy for me and no longer available. Even more surprisingly, the reps didn’t talk the Shooting Star up, but ignored it, and the house pro said it was out of production (a claim I don’t believe is quite accurate). The Bandit and Outlaw were pushed instead. I was also interested in the Infinite Theory, but they didn’t have it, either. A double bummer!, because I think you gotta throw one to know one — as you point out above concerning your reactions to the Defiant. As a side note, I’ve observed that many ball manufacturers are taking backwards steps with some of their new issues, at least as far as BTM’s reviews go. That is, some of the “older” balls have better specs than the new ones being marketed as their improved replacements. But again, I think it’s wise to throw one before buying blind and making a regrettable purchase. Seems like an oversight not to have the Shooting Star. It was only just released a few months ago. I would imagine it would be in the lineup until at least next bowling season. Manufacturers seem to be coming out with so much equipment, it’s hard to keep up. Nevertheless, I still think it would have been a good ball to test. Infinite wasn’t hear either and not surprising really. I don’t think it was as successful as expected. Specs aside, I agree. If you have a chance to demo the equipment it’s a great opportunity to do it, especially if it’s at your home lanes. BTW, I attended the WSOB in Vegas (spectator only). The Outlaw was seeing A LOT of use. The Theory line was also being thrown quite a bit. Lots of STorm staffers crossing over and using Roto. Hi David. Must have been, even to watch. I can see the Outlaw getting a lot of play. My initial review wasn’t solely based on me throwing it but also other testers as well. To that end, and after reviewing many balls, it is one that in my mind stands out as a potential keeper. I wanted to be fair to all readers. If it was my own arsenal for example, I would rate the Outlaw a bit higher than the Bandit because it matches up to my game better. As a lefty I like a control reaction a bit more based on the tendency of the conditions we see on our side. I was impressed by the ball though and continue to be. My experience was only bolstered further by throwing it again at the demo day next to all the other Storm/Roto equipment. It controls the lane quite nicely and has a nice continuous drive into the pocket. Coach, This comment would make a good column: “However, I did get to test some pin down balls which is different to what we’ve tested previously. For my game, it’s not the preferred location so wasn’t too helpful” . I hear many bowlers talking about their “favorite drillings”. Can you explain why pin down balls do not work well for you? And maybe how I could tell where my preferred pin should be? Do you have a rule of thumb where you look at axis rotation and tilt and convert that into pin location? Hi David, All very good questions. I will try my best to answer. For sure, drilling preferences will vary by bowler. You can take that to mean Pin position, Drilling angle, and VAL angle. I have a few articles discussing this and I try to explain the layouts in each ball review. To find your favorite drilling takes trial and error. I have a very high track with my PAP 5 3/8 over and 3/8 up. I have had some physical issues with some serious arm injuries over the last 3 years so my speed has varied from 18.5-19 at release to 16. Speed and revs are also significant factors in drilling preferences. For example, when my speed is slow, wider angles are better because they slow down the balls transition. I’ve tested balls with small angles at slower speeds and the ball transitions too quickly. In that instance I would get substantial amount of over/under. That’s because the ball hooks up too quick but when I try to adjust, I blow it through the breakpoint. There is a very good read about the Dual Angle Layout Method by Mo Pinel. While he did not invent this, he depicts the concept clearly in this read. It takes many reads and I go back to it often since I do not personally drill bowling balls. Do a search for that article and it will be very useful. Regarding Pin down balls for me personally, they tend to make the Drilling angle and VAL angle very wide which means the ball will get into a roll as late as possible and transition very slowly. This for some people adds control. For me, it reduces the overall ball reaction way too much. I have thrown one pin down ball which I liked but that had a hole at P3 which helped the backend reaction. I have read it and re-read it. I do understand it generally. Small VAL angle is sharper breakpoint. Large drill angle = length. Yet there is a lot of wiggle room in that description. Do I have high tilt or Low (I think low, but how do I define that)? I think I have about 45 deg of rotation (low by Mo’s standards). I do not know if Mo’s dual angle thingy would consider my speed and revs to be matched or not. Then he throws in the idea that you could have high or low ratio but the ratio can be affected by the sum of the angles. IE the 20x5x20 is the same ratio as the 60x5x60, but you would get a whole different ball reaction that way because of the sum differences. And when I look at drill guides that come with the balls they include layouts that seem counter to what I understand Mo to be saying. I get what you mean with pin down though. Your ball starts hooking late, but with a high VAL angle the hook phase is so long it would complete at 70 feet instead of at the pins. That EBonite Blueprint software sounds interesting. I will admit it’s not the easiest thing in the world to follow and it takes a lot of experience to grasp with ease. I agree the Blueprint software seems quite intriguing. If you’ve watched the demos, you will notice a clear example of why drilling can get quite complicated and why we sometimes get unexpected reaction. Every hole we drill into the ball changes it dynamically. The one poignant example was the asymmetrical ball being drilled for a 5 inch pin. After all the holes are drilled, the pin moved a whole inch which made the ball a true 6 inch pin, regardless of where that dot is on the ball. I assume that with this software, now the ball driller could make the adjustment to create a true 5 inch pin to PAP before ever punching any holes…assuming it is an Ebonite International brand ball. I think it can be a very good teaching tool if it was available for all balls, but it must take a tremendous amount of work to get each ball in the system and I have to assume Ebonite will keep it to its brands.